Thanks to its ease of entry, as well as its lower cost of entry, the binary options market can hold profit potential for both new and experienced traders alike. However, even though binary options trading methods are not as complex as some other forms of investing, the potential for trader benefit can increase greatly through use of technical analyses. Technical analyses is defined as being the study of past price and trading volume information in order to help in predicting future price potential of various assets. This type of analyses has been used for many years, and it traces its beginnings back several hundred years to when it was used by rice traders in Japan. By studying the rise and fall of past prices, these early rice traders were oftentimes able to accurately predict future prices – even without factoring in current supply and demand. It is with the Japanese rice traders that the “candlestick” method of technical analyses came about. This method of analyzing price gives traders a set of symbols that are placed on a price chart, helping viewers to see past price patterns. This, in turn, can subsequently lead traders to come up with predictions regarding potential future prices of the underlying asset. In many ways, technical analyses involves the use of pattern recognition on a chart. If the price of the asset that is being analyzed appears to be moving upward, traders will see the demand for the company’s stock shares that is likely to increase buying – and a subsequent increase in share price. Technical analysis uses both histroical price data, and the study of past price patterns to create visual signals of future price performance. It is one of the most popular and widespread techniques for trading and it popularity also helps it to be one of the most reliable ways to trade. Technical traders spot the early signs that a popular trading pattern is being created by the movement of price being driven by supply and demand. Once the pattern is complete, the trader knows the anticipated price move in the future and, with the help of many other traders also recognising this, there is a high probability that price will perform as it has done historically with the same pattern. As markets move in cycles, the most reliable trading patterns occur over and over again throughout all financial market. It is by analysing how successful the outome of each of the historical ocurrences is that will make a technical trading pattern relaible. Conversely, an alternate type of analyzing investments, known as fundamental analyses does not take into account the price movements of an asset, but rather it assesses the overall economic well being of the entity. For example, those who use fundamental analyses for trading individual stocks would study the underlying company’s assets and liabilities as well as their earnings and expenses in order to come up with a prediction of whether or not there is enough marked demand to cause the stock shares to rise or fall. Many traders use technical analyses for trading stock shares because once a trader knows the underlying asset’s fundamentals such as its supply and demand, these criteria are almost always factored into the share price. 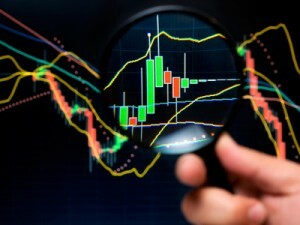 Technical analyses is used in trading a number of different assets, including stocks, futures, commodities, and options. Binary options traders can use technical analyses to help them in predicting the movement of underlying assets. In order to do so, the trader will first need to decide the pace at which they wish to trade. For example, some who trade in the binary options arena opt for 60-second expiry times, whereas others may choose a less hectic pace of weekly expiries. Those who tend to use technical analyses successfully will typically use a mix of both technical and fundamental analyses for predicting their binary options trades. This can provide a more thorough view of the asset’s past price movements and its potential future demand. For traders who use one of the many online binary options trading websites, it is likely that such technical and fundamental analytical features are built into the trading software or platform that they are using. This can help traders to integrate their analyses and trading decisions with making immediate trades. One thing to bear in mind when looking to trade technical chart patterns with binary options is the availability of a decent charting package in order to analyse price charts. Binary options platforms often provide basic charting but for this form of analysis, and the ability to aply indicators to your charts, it is often important to have an alternative charting package to look for trading opportunities. These are both abundant and also free with most demo spread betting accounts and online trading websites.